THE FRENCH GOVERNMENT, under pressure from weeks of “yellow vest” protests over rising living costs, has scrapped all planned fuel tax hikes for 2019 and appealed for calm. An increase scheduled for 1 January, was “scrapped for the year 2019″ in its entirety, Environment Minister Francois de Rugy announced on BFM TV, in an about-turn for the government. 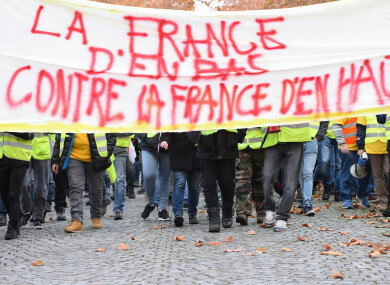 Protests erupted on 17 November in opposition to rising fuel taxes, but have ballooned into a broad challenge to French President Emmanuel Macron’s perceived pro-business agenda and complaints that he is out of touch with the struggles of ordinary people. Earlier, French President Emmanuel Macron appealed to rival political leaders as well as trade unions to help tamp down the anti-government anger that had led to some of the worst rioting in central Paris in decades, according to government spokesman Benjamin Griveaux. “The moment that we are living through is not about political opposition, it’s about the republic,” Griveaux said after a cabinet meeting. Four people have been killed and hundreds injured in accidents linked to the nationwide road blockades and protests, which are playing havoc with traffic in the busy run-up to Christmas. On Saturday, rioters ran amok in Paris, torching some 200 cars, smashing shop windows and vandalising the Arc de Triomphe, an iconic national monument. Far-right leader Marine Le Pen and hard-left firebrand Jean-Luc Melenchon have been vocal in backing the demonstrators’ demands. Macron, whose approval ratings have plummeted to just 23%, is yet to comment publicly since returning to France from a G20 summit in Argentina on Sunday morning. A frequent demand from the protesters, who are mostly from rural and small-town France, is a repeal of his decision to cut a “fortune tax” previously levied on high-earners. Philippe today called for a debate on the controversial tax cut, signalling it could ultimately be repealed. “If we do not find good solutions, we will not apply it,” he said of the tax cut. Macron made cutting wealth taxes a key campaign pledge ahead of his election in May 2017, arguing that such levies discouraged investment and drove entrepreneurs to leave France. But along with various comments deemed insensitive to ordinary workers, the policy has prompted many of the ex-banker’s critics to label him a “president of the rich”. Yesterday, Philippe had announced the first major retreat of Macron’s presidency when he suspended for six months a rise in fuel taxes scheduled for 1 January. He also froze increases in regulated electricity and gas prices and new vehicle norms which would have hit users of old, polluting diesel cars — a battery of announcements targeted at low-income families. But experts say the government may have reacted too late to the street protests, a regular feature of French political life which have repeatedly forced Macron’s predecessors into U-turns. “When you leave things to fester too long, it costs more,” Jean-Francois Amadieu, a sociologist at Paris 1 university, told AFP. An Elabe poll released earlier today found 78% believed Philippe’s concessions fail to meet the protesters demands, and most think they will fail to boost purchasing power. Some 72 percent continue to support the movement — figures which have remained stable despite the violence last weekend and the government’s climbdown. Many “yellow vest” protesters, named after the high-visibility road safety jackets they wear, have called online for new protests this Saturday. Interior Minister Christophe Castaner has urged “responsible” protesters not to descend on Paris but has nonetheless called in police reinforcements, bracing for more violence. Opposition leaders, including Laurent Wauquiez of the rightwing Republicans, have called on the government to impose a state of emergency and to deploy army units to back up the police. Adding to the image of a country in revolt, the main French farmers’ union said Wednesday that its members would hold demonstrations every day next week. Two truck driver unions have also called an indefinite sympathy strike from Sunday night, and students are blocking dozens of schools nationwide to denounce tougher university entrance requirements. Fuel shortages due to blockades remain a problem in areas of Brittany, Normandy and southeast regions of France. Email “French government scraps all plans to hike fuel taxes following fierce protests”. Feedback on “French government scraps all plans to hike fuel taxes following fierce protests”.